Join the discussion on our forums! 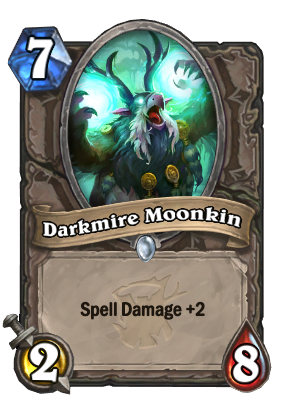 Come discuss Darkmire Moonkin over in our dedicated Darkmire Moonkin discussion topic. Birds of a feather Moonfire together. Congrats on getting the Magma Rager Award! Get 320 of these and you get a free legendary! I swear to Yogg, if this card ends up being really good then I will dust every card in my collection and craft nothing but golden Darkmire Moonkins. What is worse than playing Malganus for stats? Jungle Moonkin is a Beast, but this isn't? Is that an error? Just hearthstone inconsistency. To be fair, Moonkins should not have beast-tag, cause they are humanoids and we have a lot of beastly humanoids like tortollans and many other stuff i can't think of right now, they are not having a beast tag, so Moonkins should not too. So it's just was wrong too put a beast-tag on jungle moonkin in a first place. I wish they made one playable moonkin in the history of the game. ONE. AND WHY NOT FOR DRUID? jeez, as a former WOW Moonking, I've been waiting for the druid moonkin hero transform since the first expansion. Blizzard racist against Moonkin confirmed. It would have been so much more interesting if they made Malfurion the Pestilent transform to a Boomkin. They could have even transformed the Shapeshift Hero power into a Moonfire ping, still 1 damage, just allowing you to bypass taunts and not take damage. This is actually very good. Finally a spell damage increaser that can last one turn in board. I know everyone is saying this is horrible and boy, i've never seen 0 votes on all but bad and dust this ratings before, but with the new inner inner fire priest that boost your entire deck, well, there this can actually be pretty alright as an 8/8 spell damage plus 2 for 7.